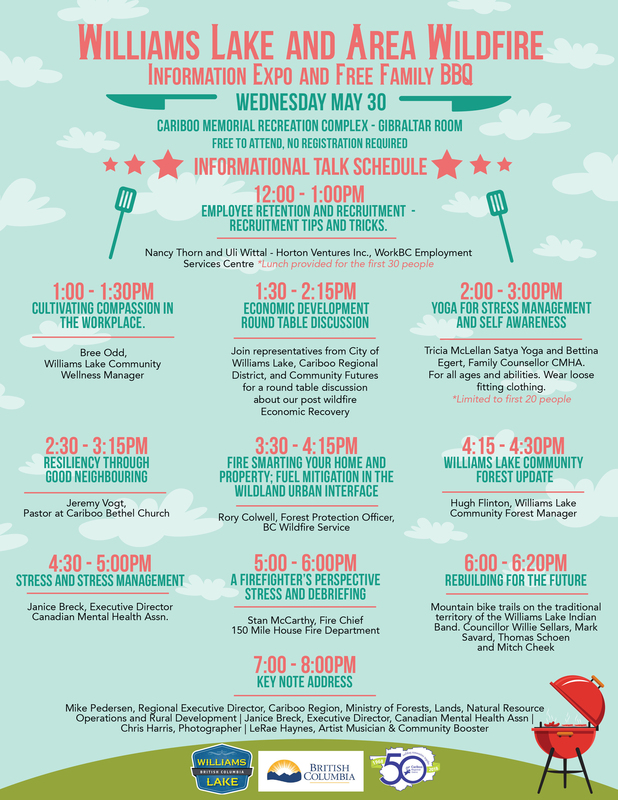 The City of Williams Lake in partnership with the Cariboo Regional District and Ministry of Forests Lands Natural Resource Operations and Rural Development are hosting a Wildfire (Community) Information Expo and Barbeque May 30th at the Cariboo Memorial Complex. In short, a primary goal of the Wildfire information Expo event is to get information out to community members that will help to reduce their stress and anxiety and to remind people how resilient they and our community are. The more relevant and timely information people have access to, the more they tend to feel in control of their lives. Reestablishing this sense of control is vital in aiding people’s mental health and wellness recovery from the lasting effects of the wildfires. As people’s concerns and interests are variable and individually unique, the event will endeavor to be as inclusive and encompassing as possible. Community members will have an opportunity for face to face conversations and to receive information first hand from subject experts from a variety of agencies. As winter in the Central Cariboo melts away, the possibility of flooding as well as the uncertainty of the 2018 wildfire season is becoming more of a focal point and concern for citizens. Everyone in the Central Cariboo Chilcotin region have been affected in some way by the 2017 wildfires and many of us may have unique concerns and reactions to the possibility of spring flooding and upcoming seasonal wildfires. Sharing this information at the Wildfire information Expo will address many concerns that people have which they may or may not be giving voice to. Additionally, the feedback received from the public at the event will assist agencies and organizations to identify areas of ongoing concern or new concerns where more information, communication and or coordination is required. Associated efforts to alleviate these concerns will also enable agencies and organizations to be better prepared for the 2018 freshet and wildfire seasons.